It was a very off week for the draft team, much aligned with how the overall gameweek went for many in the traditional game. A overall score of 26 didn’t help my case, as I dropped down to third place, now 52 points off the top spot and just 5 points out of second place. 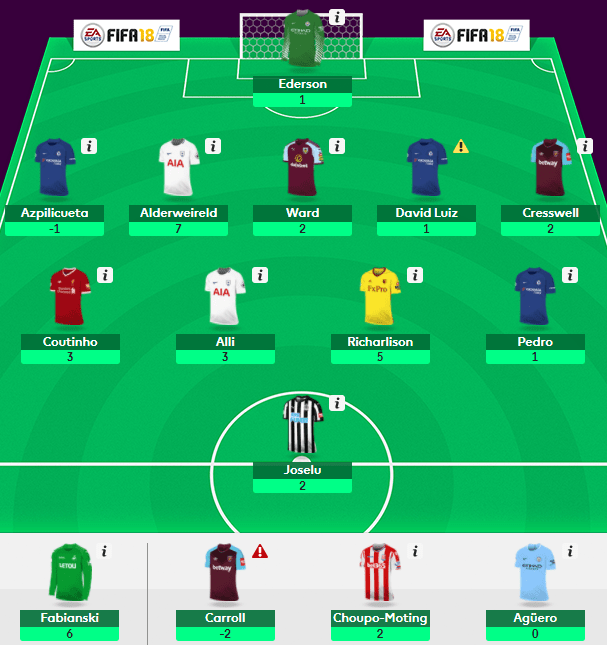 All is not well with my squad, as I have been struggling to find offensive points with Aguero still sidelined due to injury. Thankfully I do feel I have strengthened my squad through transactions. Defensively, Alderweireld was the only player to show up and return 7 points, on the back of a CS and a single bonus point. Chelsea losing to Palace saw Azpilicueta and Luiz combine for zero points, giving up an own goal and Luiz picking up a knock headed into GW9. Between the sticks, I thought City would keep it clean against Stoke, but Ederson gave up two goals, while Fabianski (bench) recorded his 4th CS of the season. With the recent acquisitions of Richarlison and Chuopo-Moting, I look to play a 5-4-1 or a 4-5-1 to take advantage of some good midfielders. Richarlison was my top midfielder, picking up the assist. Alli and Coutinho each picked up a point for a CS and Pedro still not got on track with just a goal and assist on the season. Up front, I moved Hernandez, but retained Carroll, even though he picked up a red last week. Thankfully he wasn’t starting as he took a -2. Aguero still injured resided on the bench with no intentions of dropping him. So it was Joselu making his second appearance in my squad. Great underlying statistics, but still came up with no attacking returns. This week I have claims in for 3 new players in Tammy Abraham, John Stones and Wilfried Zaha, all of whom could make a start this week. Luiz is currently flagged with a calf injury, but going 4 at the back would not be a problem, given the players I will hopefully get when waivers is run. It’s still early in the season and my squad if performing. The top squad is living off the likes of Lukakau, Mhkitaryan and Jones from United, as well as Eriksen. However this team is getting Morata back, which could only strengthen the hold on the top spot.